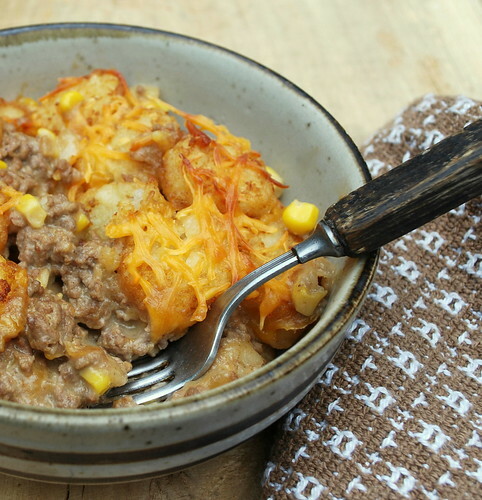 The Cutting Edge of Ordinary: Cowboy Casserole - looks like dog food - tastes delicious. I'm so happy that summer is ready to get the heck out of here. Those of you that know me, know that summer is not my favorite season. In fact, it's my least favorite of the four. If it could just be kind enough to arrive without the heat and humidity, I’d really enjoy it a whole helluva lot more. Humidity is not my friend. Bad. Bad. Bad. It makes my hair frizz. Frizzy hair is not a good look for me. Fall, now that is my season. My hair does not frizz in the fall. This makes me happy. I enjoy cooking and baking so much more in the fall. My kitchen is a little cozier when the oven is heating it up instead of the sweltering heat from outside. I can barely wait for all the soups, stews and casseroles that are just around the corner. I saw this recipe is an issue of Taste of Home and I literally couldn’t wait to make it. Luckily the weather wasn’t as hot as it has been over the past few weeks. Now as you can see from the title…this is nothing to look at. It’s not a pretty looking casserole, but what casserole is really? I changed it up quite a bit. This is the kind of dish that you can really make your own. It is what my husband would call a “stick to your ribs” kind of meal. It’s comfort food on a fork. I've made it two times in 3 weeks. Think shepherd's pieish, with a wicked twist. A delicious mix of hamburger, cheese and corn sandwiched in between a layer of crunchy tots. It's the kind of dish Napoleon Dynamite would give 2 thumbs up too. My casserole dish missed me. "sniff"
Before I got ready to make this casserole, I let the Crispy Crowns sit on the counter to defrost for an hour or so. The original recipe used still frozen tater tots, but I felt they wouldn't cook as well if they were still frozen solid. *Note - The second time I made this I prepared it the night before and stuck it in the fridge overnight. I took it out about an hour before I wanted to bake it, just so it could come to room temperature a bit. I think it was even better than the first one! "Looks like dog food..." I had to laugh! I always have trouble photographing stuff like pot roast or meat loaf--very unattractive but tasty! I've made this one! A couple times. I'd forgotten about it, so thanks for the reminder. It is a great/easy/yummy Fall dish, for sure. I am the opposite of you in terms of the seasons, though - I want summer to go on forever. Whimper, whimper. This is my absolute favorite food. My family has been making a simpler version since I was a baby (but we call it Tator Tot Casserole). We just use a lb of beef, a can of corn, a can of mushroom soup, cheese, and tator tots. Also, I have recently started to make a different version - sub beef, corn, and mushroom soup for chicken, broccoli, and cream of chicken soup, then sprinkle some seasoning salt on top. Sometimes I also add a bit of cheese soup. It is GOOD. shouldn't every good recipe come with the tagline "looks like dog food-tastes delicious". You crack me up my friend! My girl is going to love it. I might just have to make a change to the meal plan. You know what I'm thinking...apple cake, applesauce, apple crumble, apple dumplings...yummm for fall. What temp do you cook it at? I was thinking high - like 375 or so since the tater tots need the high heat to crisp up. I have this made up, sitting on the counter - I'll cook it a little later but I wanted to share my little adjustment to the recipe. My kids don't really care for corn so instead, I cut up 3 spicy beans (from a jar) and added them. I'm crossing my fingers. Pamela I'm sorry! I left out the temp. I just corrected that! I actually baked it at 350 and the tots browned right up. As I said, I let them defrost a bit so they weren't frozen solid when I put them in. Ohhhh, YUMMY! What a GREAT recipe - my two teenage boys devoured it! Used 3 spicy green beans instead of corn and all they said was "what was that green thing?" This is definitely a keeper! Thanks! Fantastic casserole. Look pretty good actually. Not anything like the dog's dinner. My kind of dish. Just found your blog. Look forward to following you here. It looks wonderful. Everything was fine until I got to the Tater Tots. (take a quick look at the label - ouch!). I'm gonna make this (Or very close) but will substitute sliced real potato rounds, probably with a little par-boil. If it boes not brown/crisp as expected, a quick pass under the broiler will do it. Thanks for sharing this. Good Pix. And NO, I don't tink it looks like dog food. Very attractive dish. Believe me, this does not look like dog food but I had to laugh! It is difficult to photograph casseroles with gooey cheese but I bet it was delicious. I'm pretty sure my husband would love this dish! My Husband makes a version of this with Mac and Cheese as the bottom layer, and corn AND green beans in the meat layer. He calls his 'Junk Food Pie' I may have to get him to make some this week! OMGoodness you brought back memories, I use to make this for my kids years ago, we called it Tator Tot Casserole and I used peas or sometimes green beans for the corn. it's so good, stick to your ribs good! Dog food or no, it sounds ridiculously yummy. Found you via pinterest (you're trending!) so I had to come and see. I made it tonight for my family and it was a huge hit! Thanks for sharing! The cheese measurements in the recipe directions did not add up to the amount in the listed ingredients. Which one is right, 1.5 cups or 2 cups? Thanks! This passed the test with my hubby and boys! I made a double batch so I could bring a meal to a new mama - they loved it, too! In my parts we call this Tater-Tot Hot dish. Every family, every person has a different version. But it has the same bones, ground meat (usually beef), cream of something soup, milk, veggies, with a layer of tots on top! I love the layer on the bottom as well, I may have to try that the next time I make my version of the hot dish! This sounds really warming and a good dish for a cold autumn/winter night.... what are tater tots tho? we don't have them over here in the UK, the only thing i can think they might be is mashed potato rolled in breadcrumbs? in the UK we call them potato croquettes, is this what they are? Lisa, let me see how I can describe them. They are like a crunchy potato puff? They crisp up in the oven. If anyone else can help me out, jump right in, lol. Tater-tots are like baked hash-brown bites! It is almost the same as what Tater-Tot Casserole is for me. We just do not add the sour cream. But my family loves it. so easy to make too!!! I will be making this! Love those recipes that are easily customized and will probably try subbing ground turkey for a leaner alternative and adding some other veggies... bell pepper? My husband will love this!!! I have a similar recipe except instead of ground beef I use bratwurst (sp). Just remove it from the casing. It disappears in minutes. This looks amazing! Saw it on Pinterest and had to see what it was. Now, I don't have tater tots (I know, how could I not?!) but I have a bag of frozen hash browns. Do you think I can still whip this bad boy up? Also should I use the same time and oven heat? I would love to try it! Sara I think they would work. I wouldn't adjust the temp. Let me know how it works out! It's an easy way to sneak some veggies in on picky eaters. Coincidentally, I picked up a bag of tater tots this week just to make this dish. I'll try adding the sour cream to see what it does for the flavor. For those who don't like the preservatives in tater tots, try shredded hash browns on top, with a handful of shredded cheese and a bit of salt and pepper. You'll get a similar taste without the fat and preservatives. Rock on, fellow casserolers! Sounds absolutely YUMMY! Can't wait to try it. For someone on a gluten-free diet, what do you think you'd substitute for the cream of mushroom soup? I have made similar to this in the past and a good tip for leftovers (makes to much for my small family). We love it the next morning with over easy eggs on top and some toast! Can you substitute cream of celery for the cream of mushroom? Ohhh my was this good!!! I used the same kind of tots and while I browned the meat, I put the bottom layer of tots in the oven to get crispy. Also used green beans instead of corn since I didn't have any corn. But still sooooo good!!! I had to stop my hubs from takin all the leftovers to work to share because that would leave me with slim pickins!! Try it with ground sausage and no corn for a tasty breakfast!! I also substituted the corn for drained rotel tomatoes and didn't use the milk.. I live it!! I grew Up eating "Tater Tot Casserole" Love it, I put peas instead of corn and add a cup of small cottage cheese into the mix, but still the basic recipe!!!! Try this version you will love it! My husband and son would love this dish. Meat and taters....my hubby's favorite. Looks yummy! Make this a lot....take it for luncheons and always bring back an empty dish!!! Totally not my healthiest meal, but sooo yummy! Thanks for sharing, glad I found this on pinterest. Even the hubby couldn't help but have seconds. Thanks again. I have made this before and yummo! One night I layered the bottom with onion rings from the frozen food section. It was a total hit! Yum, my family loves tater tot casserole! For the person who asked about gluten-free substitutions, they do make gf cream soups now. If you cant find them in your area, alfredo sauce is a good substitution - maybe a light version to cut back a little on the richness. my sister is newly gluten-free & the cream of mushroom she got was tasty. We have been making this for years calling it tater tot cass. Frozen taters work fine but I don't put them on the bottom. Meat mix on bottom,layer of cheese, tater tots on top. I also bake it according to the tater tot packing, for time & temp. My nephew likes the mini tots on his. This recipe was so amazing! Thank you so much. The second time I made this I added a can of chopped green chilles to add some heat! Amazing!!!! Want to jazz up the hamburger a bit???? After draining hamburger sprinkle an envelope of dry onion soup mix on the meat and stir good...I also like to add the cream soup to the meat while still on the burner...helps distribute it evenly through the casserole...happy eating!! We are eating it for dinner right now and it is excellent!! I used venison instead of the ground beef. Thank you for the recipe. Other than the corn, this is similar to one of our favorites. It's really good with some warm homemade bread out of the bread machine. Thanks for sharing it! I have made this a couple of times after I saw it on Pinterest. Making it again tonight. Thanks!!! My familys favorite tator tot cass. has frozen mixed veg .and cream of chicken soup ,no sour cream and no garlic and the cheese is 1 cup sprinkled on top .. I almost didn't try this because you said it looked like dog food, but maybe that is what made me look--- who knows. But it will be a good recipe too make on a Sunday night. My husband loved it. I used the large can of mushroom soup and extra cheese because he hates anything dry and we love the mushroom soup. So I used a large dish and it turned out great I left the crispy rounds out overnight, so that they would not be frozen and made it with my cake at the same time, for around 25 min. Not too brown. Husband went back for seconds. Said don't lose that recipe. Thanks. I make this with Jimmy Dean hot sausage instead of hamburger - we love the extra 'kick'! Tried this for dinner tonight and it was great!!! Even my picky daughter loved it! This is one of my go to dishes when i need to take food to a sick friend or someone who has had a Death in the family. i usually put together wrap in foil and put baking directions on top then recipiant can bake or freeze til later. Well I was looking for something new, fast and with ingredients on hand. I looked this up and it sounded like a familiar dish that I had enjoyed before but with a few twists. I cooked it and enjoyed it with my 3 year old. I wasn't overwhelmed and figured once my DH had sampled it that would be it. Well he let me know he didn't know what I called that dish leftover in the fridge but he called it PDG. Pretty Darn Good. I was pleasantly surprised. Will make it again I am certain. Its looks very similar to what MN calls tater tot hotdish. Being a transplant, it took me a long time to try it. But now, it is a staple in our households. Thanks for sharing. 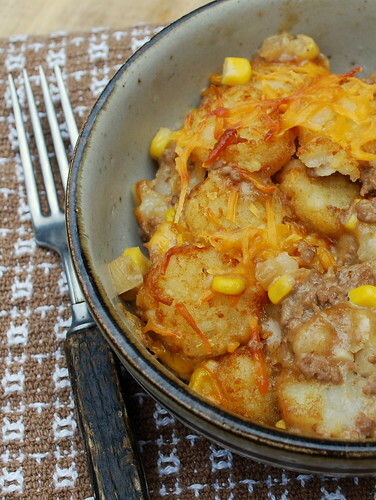 Very similar to our family favorite called Tater Tot Casserole. I usually added a pkg of Lipton Onion Soup Mix to the cream of mushroom mixture, then it was poured over the top of the meat and tots...no cheese...but my daughter added cheese for her family. I never tried it with corn, so I decided to mix it up with a can of chili beans too, then added taco seasoning mix to the meat. So now I guess it's Fiesta Casserole! Sure smells good right about now! I make almost same thing but I bake the tots (while cooking the meat)so they will be a little crisp and bake for 30 mins. We featured this recipe in a new blog post. You can check it out here. Thanks for the great recipe. Not a big fan of tater tots, but I made do with an alternative. I keep cooked rice, seasoned with garlic and chives, around most of the time. Incorporating 2 cups of pre-cooked rice makes this a winner for us, sans the tots. I found this recipe when my kids were toddlers (they are teens now) and they always loved it. Instead of corn, I use frozen mixed veggies. Just pop them in the microwave for about 4 minutes to defrost and heat up a bit before mixing in to the rest of mix. My mom made this when I was little. And it was called tator tot casserole. Relish! My family ate it up! Had to use cream of chicken in a pinch and it was so good! Made this the other day but used O'Brien Hash Brown potatoes instead of the tator tots or crispy crowns 'coz that's what I had. So in response to those that wondered about using hash browns, YES!!!! It's great!! I put a layer of hash browns on the bottom and then spread the rest on the top. My husband, who doesn't care much for casseroles, LOVED it!!! He ate over half! It was good warmed up the next day. So here's the answer to whether it would work with hash browns........a resounding YES! Thanks for a great recipe keeper. thanks for the delicious dinner idea, made it tonight and even my picky toddler scarfed it down! Thanks! Okay... I'll admit that this comment has nothing to do with Cowboy Casserole (other than the fact that I'm making it tonight!! YUMM!) ... But I feel compelled to relieve all my fellow "curly sisters" out there of their frizzy woes! Run out NOW... Don't stop, and get the book "Curly Girl" by Lorraine Massey..then go to the supporting website naturallycurly.com. I swear on my life, if you follow her instructions to a "T", it may just change your life, not to mention your relationship with what I always called "the monster on my head" PLEASE, PLEASE, PLEASE... take a chance, after all what have you got to lose besides frizz? Okay, I'm off my soapbox now! Good luck curly girls, and happy casseroling! I don't have a profile I can post here with, but my email is heather.pendergrast@yahoo.com feel free to drop me a line! I love to hear about food or hair!! My sister-in-law is making this while I'm typing. :) it sounds really yummy!!!! I can't wait to try it! Made this for the family tonight and they loved it. My mom made this for me when I was a little girl. Thank you for reminding me of this yummy dish. Cream of Celery or chicken work great too, I always use cream of chicken when I make mine! Made this tonight for my husband and I, and it was a big hit. I added a bit of homemade taco seasoning to the meat and a can of black beans. Will definitely make again. Is there something else you can use for sour cream?.. I really want to try and make this but I'm not a huge fan of sour cream. You just descibed me. LOVE fall, hate humidity. I have curly hair so it of course turns into an afro! I love all the wonderful recipes we tend to only make in the fall and winter as well. Soups, stews, casseroles. I can't wait to try this one. July 2012 - I just saw this casserole on Pinterest and checked it out, and then read your comments about Summer. I couldn't agree with you more!! Summer is so awful with the heat and humidity. I suppose I could move. But I'll probably just complain about it. I'll try your Cowboy Casserole in a couple of months! I make this just as it's posted and my family LOVES it! They are so excited tonight that we're having it again that everyone is going to be home :) Thank you for posting! Love your cowboy version of this. Our family has been eating "tater tot casserole" for years. We have used various meats, vegies and soups combined with tater tots and its always good comfort food. Our favorite is ground beef with taco seasoning and sauteed red and green bell peppers, corn, nacho cheese soup and tater tots with Mexican mix cheese on the top. Always a hit at our house. I'm makingthis right now to sit in the fridge until time to bake it for supper! Do I foil it/cover it before baking? Making this tonight! Its steady made and in the fridge to bake later! One question, do you cover/foil it at all while its baking? Samantha, I cover it with foil and uncover the last 15 mins or so. Let me know how you like it! I never made this with corn but I have added green peas before. I made this last night with canned asparagus tips (needed to do something with that can) and it was actually delicious. I think next time I will do this with a can of cream of celery. I think the celery would compliment the asparagus even more. I've always called this tator tot casserole. I make mine with out corn in it though and put chopped onions and bell peppers in it. SO good! Or sometimes I just leave out the veggies. One of my kids' favorite meals. I also make a breakfast version with scrambled eggs and sausage...you can put the chopped onions and bell peppers in that as well. Could you use corn and peas? Tried this tonight and it definitely has potential. My family thought it was too "dry" and needed another can of cream of mushroom soup. I also would have put just one layer of tater tots in it instead of two. But, I think next time I will make it with hash browns instead because I'm not really a fan of tater tots. I think the reason I didn't like this as well as I thought I would was because my mother-in-law is British and makes the most amazing "cottage pie," which is very similar but with mashed potatoes instead. Made this tonight with a from scratch mushroom cream sauce. Fantastic! Used almond milk in the sauce. Awesome! This it's what we called "Tater tot hamburger casserole" when I was a kid. This is what we called "Tater tot hamburger casserole" when I was a kid. 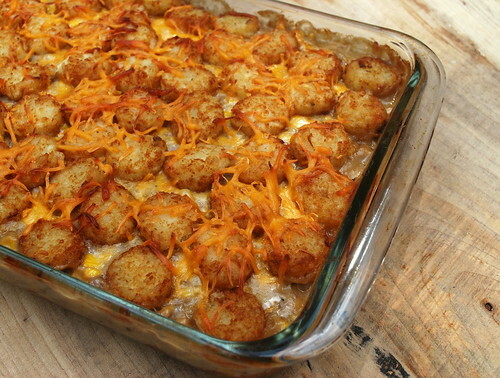 I make this for my family - Tatertot casserole. Very similar but I put green beans and corn in it. I also make a small amount with no meat for my vegetarian son. I don't know how I would like the corn in it. I think maybe add some bell peppers and rotel tomatoes. Or, maybe even some jalepenos instead! Sounds delicious, though! I made this but used a can of tomatoes with peppers and added bell pepper chopped both then added a package of taco mix. Omit the soup. Use mexican cheese. We loved it. Made this but seemed a little dry and 25-30 min was definately not long enough, our tator tots on the bottom were still pretty cold, most hotdishes are about 45- 1 hr cooking time, may try that next time. Thanks! saving this for future reference. Sounds great! Very cute article about the "weather" I'm with you on summer! we are trying this today? :) Happy Baking!!! I have made this for years, my kids love it and make it for their kids, We call it tater tot casserole and add chopped broccoli to it. Instead of ground chuck, use left over grilled steaks...no BBQ nor steak sauce, of course. Has anyone done this in a crock pot? I travel full time and use my crock pot for almost all meals in our camper or hotel. I think all would be great, but I'm not sure about the tater tots. They won't brown. After reading all the comments, I might just leave the tots out and serve the meat mixture over rice or mashed potatoes. Any thoughts or suggestions? Made this with sweet potato tots. Yeehawwww! We made this for years with a few alterations. I use cream of celery and no sour cream or milk. Tonight I made it and did something different. We had a TON of leftover mashed potatoes from Thanksgiving so I did the layer of round tots on the bottom but I made potato cakes for the top. The potato cakes made it AMAZING. I totally recommend that if you have leftover mashed potatoes. OMG! I just made this. Very yummy. Comfort food. I used a mixture of onion flavored tater tots and regular. And since it's after Thanksgiving, I added in my leftover cornbread casserole instead of the can of corn. I also used Velvetta because I like how it melts better than cheddar. Had to cut garlic to one clove as it upsets hubby's tummy. But very minor changes. Very good results. Potatoes pancakes make anything more amazing! LOVE them! I have made something very similar, but in place of the milk I have used red wine. Yummo!! I made this with ground turkey breast and healthy request cream of chicken soup. I also added a lot of different spices and herbs to the turkey since its so bland. I used half a can of french fried onions too. I left the tots out on the counter for a couple of hours to defrost. It was great. I've been making this for YEARS, never pre-thaw the tots, comes out fabulous. I've been making this recipe for YEARS. Never pre-thaw the tots, and it comes out fabulous. One of my favorites! Hubby and the boys gave a big thumbs up and said this is one I should make again. I am a happy mommy/wife.Oh...and I really liked it too!! My mom used to make something like this when I was little. Thank you,can't wait to try it. Love the dish and I'm with you all the way with the season thing.....I hate summer!! heat, humidity and bugs.....Nasty! Sounds awesome and going to try tonight but after reading the recipe a few times to make sure I wasn't missing anything you only mention 1 and a 1/2 cups of cheese and recipe calls for 2 cups?? Where does the other 1/2 c. of cheese go? Add it to the top! I love tator tots, I love ground beef, corn, cheese -- all of it! However, this just didn't go over with us. Seems like a total hit though! I use frozen mixed vegtbles instead of cor, It is delicious. I always substitute cream of chicken for cream of mushroom. Love this stuff...except Id use less or no garlic and veg all (mixed veggies) instead of just corn. Yum! I have made a similar version...to keep your tots cooked to perfection....spray your dish..put the frozen tots on the bottom...while your Browning the beef...cook the tots for about 8-10 min....then add the rest and it will be great...also I layer in French fried onions and skip top layer of tots...also good w cream of chicken and green beans. I made this with ground turkey and sweet potato tots, it tasted pretty good. I've been reading the comments, and was surprised no one mentioned using velveeta. We make the meat without stirring in cheese, then put a layer of velveeta before topping it with tots and cheddar....so good! Just saw this love the dog food comment. As a child my mother had a home day care in our home Every Friday night for a few months she had two families with 3 kids each stay for dinner. Friday night dinner was always simple and a lot of it, usually Spaghetti. One of the kids nick named it dog food and fish worms. 40 years later I still call it dog food and fish worms! I have made this several times, only I also add crumbled bacon on top. This is a huge it with my family. I always wonder which type of Cheddar cheese you should use. Mild, medium or sharp. There is a big difference in taste. I found this on Pinterest. I made it and it was really good! My family loved it!!! I used "potato rounds" - like a flat tater tot and 1 lb of beef. It turned out great!!! Thank you! Going to substitute cooked chicken cut up into bite size pieces and add some bell peppers! Sounds good! Sour Cream Pound Cake - Plain good.